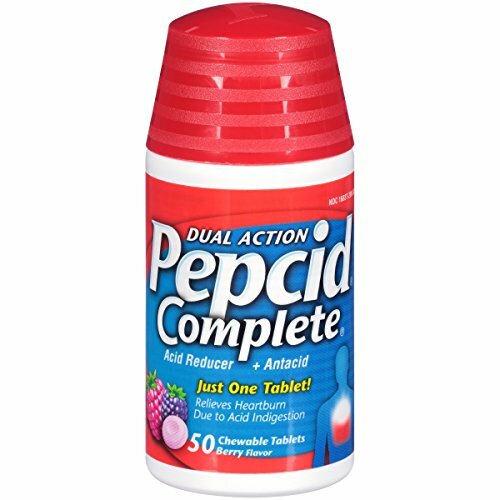 Quickly relieve heartburn associated with acid indigestion and sour stomach with Pepcid Complete Acid Reducer + Antacid Chewable Tablets. These berry-flavored chewable tablets combine a fast-working antacid and a long lasting acid reducer to help control acid all day and night. * The dual-action formula starts neutralizing acid in seconds and lasts longer, so you don't have to choose between hurting now or hurting later. * Based on 9-hour acid control studies during the day and 12-hour acid control studies during the night. Acid control does not imply symptom relief. If you have any questions about this product by Pepcid, contact us by completing and submitting the form below. If you are looking for a specif part number, please include it with your message.